TP-Link Deco M5 is easy to setup and offers great value for money, but it isn’t as fast as the more-expensive offerings. Mesh routers aren’t exactly new, but until now they’ve tended to command the kind of price points that have kept them out of the reach of the majority. TP-Link hopes to change that with the Deco M5, which offers up a mesh system much cheaper than the competition. In case you haven’t been keeping tabs on the wonderful world of wireless connectivity, mesh takes the flaky coverage of the traditional single router system and replace it with a better coverage by employing two or three units. In the case of Deco M5 Whole-Home Wi-Fi System you get three units in the box. The big news about the TP-Link Deco M5 offering is that at $300 (£230, around AU$400) it’s more affordable than most of the competition. Google WiFi will set you back $279 (£310, around AU$360) for three units, while the high-performing Netgear Orbi rolls in at closer to $400 (about £320, AU$520) for just a pair. The BT Whole Home triple pack can be had for about the same money as the Deco M5, but is only available in the UK. As with other offerings, you can buy additional satellites if you feel the need, although as this is a three unit offering, you probably won’t have to unless your home is very long, or particularly large. An important aspect of this new breed of wireless solutions is that they’re not the traditional routers and extenders that the more tech savvy are used to. Gone are they unruly antennas of yore, replaced by stylish designs and simple interfaces. Indeed, on the Deco M5 M5 units there’s a single LED at the centre of the unit that lets you know everything you need to about its current status: red means there’s a problem, orange and blue only appear when it’s being set up and green indicates that everything is working as intended. You do get more information from the app that runs on your smartphone, but even here it’s generally broad strokes stuff to do with the devices that are connected, and the throughput they are enjoying. It’s simplistic in a way that your average joe can get it up and running and doesn’t require that they fancy themselves as a would-be networking engineer on the side. The three units are attractively designed with a hint of minimalism, with the aforementioned LED being joined by a pair of Ethernet ports on the read of the unit (if a cylinder really has a rear), and a USB Type-C port used as a power connector off to one side. There are no obvious holes for wall mounting, but the design is such that you really won’t mind having them in plain sight. They’re very much like the Google WiFi mesh system in that respect. In order to install the Deco M5s you need to install and run an accompanying app - it is available on the Google Play store and Apple App store. This app is clear and straightforward to use, and setting up the network was was quick and painless. The initial unit was installed and up and running in a matter of minutes, with the other two units taking about the same amount of time. You do need to set up an account with TP-Link in order to do this, but it works well - made easier by the fact that the app uses Bluetooth to communicate with the Deco M5s so that you don’t have to keep entering the same information. One thing that TP-Link has done to try and set itself apart from the crowd is provide a one-stop solution when it comes to security, bundling as it does a three year subscription to Trend antivirus. You also get parental controls to ensure that the little ones aren’t visiting the wrong kind of sites. 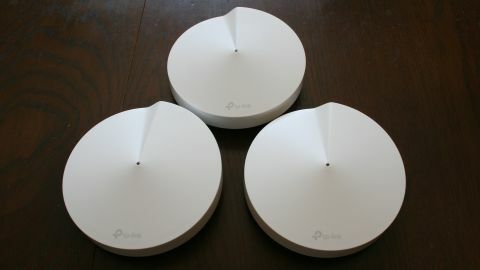 The TP-Link Deco M5 units are focused more on coverage than high-throughput, although the connection was much, much stronger than what we had previously. We did see patchy throughputs initially, but once the devices were bedded in for a while, we saw throughput improve significantly. Going from a single router with a smattering of powerline gear to the Deco M5 was a revelation. The network may not be super fast, but it does work, and affords total house coverage seamlessly - with connected devices jumping between the various Deco M5 unitss as needed. If you want serious performance, then you can connect your the units together using Ethernet, and it’ll use the best connection possible when assessing the networking infrastructure, although this does kind of defeat the point of their flexibility. For the most part they’ll use either the 2.4GHz or 5GHz band to maintain a connection, which we found worked well enough. The TP-Link Deco M5 is incredibly easy to set up, and the coverage it provides from the three units is a genuine revelation. The design is pleasing and minimalist, and including two Ethernet ports on each unit gives plenty of connection possibilities. The accompanying app is easy to use, and makes monitoring the network as straightforward as possible. The inclusion of the security software is just the icing on the cake. The performance tailed off quite quickly at longer distances where more obstructions were involved - more so that we’ve seen from the likes of the Netgear Orbi. We would have liked the app to provide a bit more information on the network itself, but this is a minor criticism. There are two things that stand out for TP-Link’s mesh offering: the price and the ease of use. Individually these would be enough to pique our interest, but together they make for a great combo that is only slightly let down by the top-line throughput. The fact that this is AC1300 kit means that it simply can’t compete with the likes of the Orbi, but then they are more expensive. You really do get what you pay for in that respect.